Although 2018 came to an end almost a month ago, I think there are still few of us who are trying to make a resume of the past year (financial, emotional, experiential, etc). I will try to make a resume of my cosmetic experience throughout this past year. I buy my skincare, body care and makeup mostly online. I keep track of everything in the excel spreadsheets, so I can give you some numbers just for fun. In 2018, I made 143 orders online and this means that the postman often rang at my door and that the delivery vans often stopped in front of my house. In average, I received at least 1 package in 3 days. There were some days when 3, 4, 5 packages waited for me to come from work. I’m still the target of my household members’ jokes when it comes to the number of packages I receive. My father finds hilarious the fact that I order my skincare from South Korea / Japan. Maybe I should buy him something? I’m still waiting for some packages to arrive. Lately I decided that I should try to be on a shopping diet till my birthday which is in April and that’s why I went a little bit crazy with some orders between Christmas and New year, just to enjoy a bit more in shopping. So during past year I opened 154 different beauty products (skincare, makeup, body and hair care) and I emptied 163 products. My beauty stash is not that big as it used to be before, although I have a lot opened products. To be exact, for the moment, I have 96 different beauty products I’m currently using (some of them more frequently, and some of them rarely, but still in use). So, let me take you through my 2018 also with few letters. A as Acwell – or more precisely as Acwell licorice. I adore this toner which I used as first step of my routine. It replaced the first treatment essence, making my skin a perfect canvas for absorption of the next steps. However, after I emptied it, I had lot of problems to find it online and finally when I found it, the seller which was offering it, increased its price for 5-6 USD, which made me really angry (I say angry to stay polite). 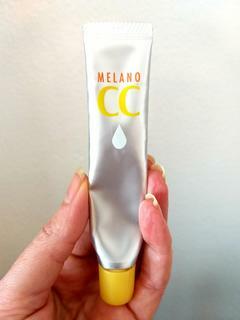 C as C vitamin serums – 2 serums containing C vitamin blew my mind completely this year: Melano CC serum and Klairs Freshly juiced vitamin drop. Both of them really made a difference in brightening my skin tone and helping fade out some dark spots. My skin has always been in love with vitamin C serums and these two made even stronger this love. 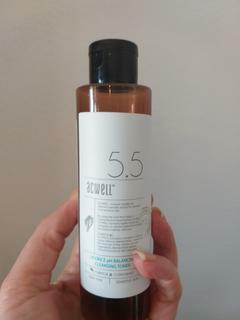 H as Hanyul Pure Artemisia cleansing oil – perfect cleansing oil and perfect 1st cleanser. It foams nicely and removes perfectly the make up and cleans the face without leaving any oily residue. I love the scent. This oil made me buy the sheet masks from the same line (Pure Artemisia) and I love them also. I as Isntree aloe soothing toner – the toners I’m using are the ones that I repurchase constantly (Pyunkang Yul mist toner, Muji Mujirushi High Moisture, Hadalabo Gokuyjun hyaluronic acid lotion), but still I managed to discover this aloe toner from Isntree and I love it. I usually use it in my routine after Pyunkang yul mist toner and I usually layer it (2-3 applications). It is absorbed nicely without sticky residue (which can happen with aloe products), it refreshes, soothes and moisturizes the skin in a such a great way, that I always enjoy in this feeling and wait at least for 15-20 minutes before putting anything else on top of it (of course, when I have time for this ritual). M as Manyo Factory Miracle overnight mask – this is my HG sleeping pack and the biggest discovery of 2018. Before this, I only tried 2 sleeping packs. One of them was Enature’s Birch juice hydro sleeping mask which is really great and I talked about it in my summer favourites post. And then I fell in love desperately with this sleeping pack. It has a jelly consistency, sinks in fast and perfectly in the skin even if I exaggerate with the quantity and in the morning, my skin is smooth, radiant with that beautiful glass skin effect. I already have a backup tube in my stash. P as peptides – one of my biggest discoveries of 2018 in terms of ingredients. I tried some wonderful peptide serums which made my skin smoother and firmer. 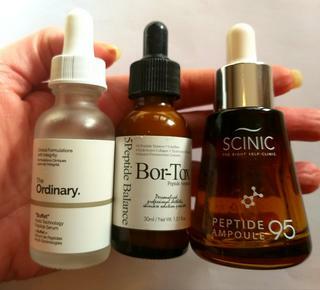 I started with amazing Klairs Midnight blue youth activating drops (I wrote about it in my Empties 2 post), continued with The Ordinary Buffet, then tried Scinic Peptide Ampoule and Medi-Peel Bor-tox and finally Tonymoly Bio ex cell peptide ampoule. I will never be without a peptide serum ever!! S as sheet masks – as a huge fan, I cannot have an overview without mentioning the sheet masks. The ones that I discovered during 2018 and that I really liked are: My Beauty Diary Oligopeptide, Klairs Midnight blue calming mask, Hanyul Pure artemisia fresh calming mask. So, these numbers and letters marked my cosmetic 2018. I really enjoyed and of course I will keep on discovering this wonderful beauty world (even with my no-buy till further notice decision for the beginning of the year, to which I will come back in one of my futur posts). I still have to share with you my empties for November and December 2018 and then I will say a forever farewell to my cosmetic 2018. Till next time, stay healthy and beautiful!